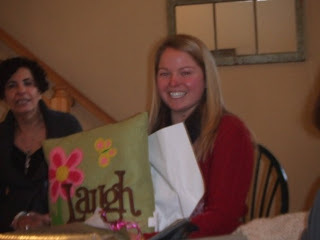 Meg opening her Secret Santa gift at the Holiday Staff Brunch.....perfect message! Did you know that even thinking about doing something that makes you laugh significantly boosts your body's "feel good" chemicals? These chemicals lower blood pressure and help you improve your immune system. Plus laughter is FREE and doesn't take too much time! So what are you doing running around like a chicken with your head cut off this week? Watch a funny Christmas movie, like Christmas Vacation, Christmas Story or Elf. Make it your favorite this week too! A laugh starts with a smile.......there's no time like the present. I picked up some great inspiration from Peg McQueen's blog, Myspace.Om that really got me thinking. I love Peg's idea of the monday mantra. I had to ask myself in what ways do I sacrifice my needs or give fruitless time and effort to something (or someone). I'm not talking about things like volunteering or being available for family members when needed. You know exactly what I'm talking about! I think it's an especially great mantra for this season. How often do we get caught up in activities and events that really aren't a priority and we end up not feeling so great in the end. instead, generously offer yourself to those who know the true gift you are. and for this, your returns will be infinite. Well said Peg! Be sure to check out her blog, find out what this week's Monday Mantra is and catch some of her infectious energy!